The new trends in technology, allied to the industrial revolution has been creating opportunities for developments in almost every industrial field, which includes the mining industry. Mining 4.0 is a recent conception, trying to achieve optimal production control through digital and technological innovations. 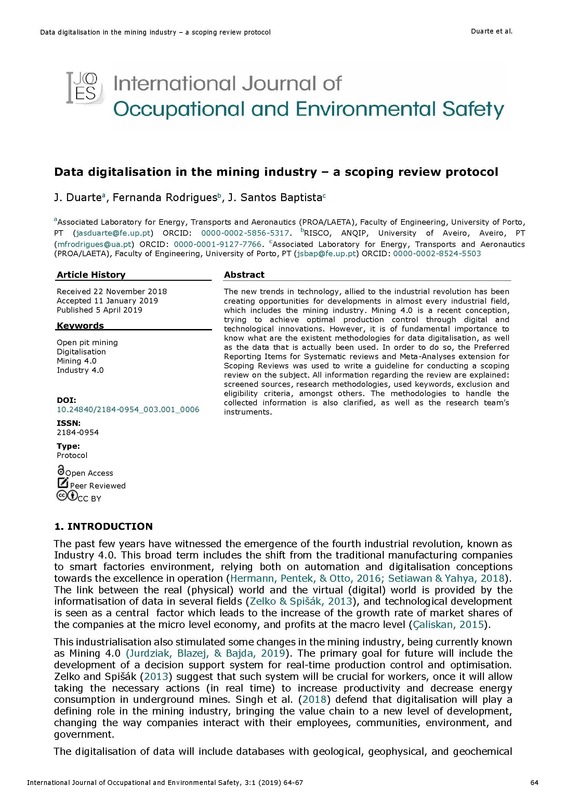 However, it is of fundamental importance to know what are the existent methodologies for data digitalisation, as well as the data that is actually been used. In order to do so, the Preferred Reporting Items for Systematic reviews and Meta-Analyses extension for Scoping Reviews was used to write a guideline for conducting a scoping review on the subject. All information regarding the review are explained: screened sources, research methodologies, used keywords, exclusion and eligibility criteria, amongst others. The methodologies to handle the collected information is also clarified, as well as the research team’s instruments.